This is the earliest example we've seen of the Pigskin Review program. Pigskin Review was one of the two big companies (the other being Goal Post) that printed most of the game day programs for the Southern California schools from the 20's through the early 60's. 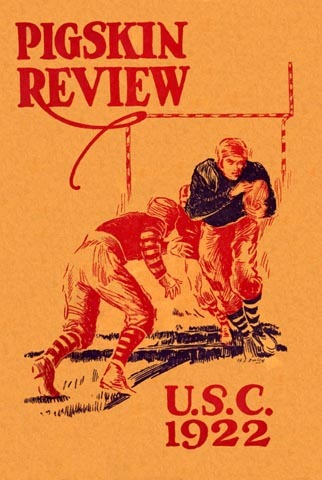 This particular design was used for all the Trojans' home games, the bigger of which were played in Pasadena's Rose Bowl. The Los Angeles Coliseum opened its gates the following season.